Our brains were designed for tribal life, for getting along with a select group of others (Us) and for fighting off everyone else (Them). But modern times have forced the world’s tribes into a shared space, resulting in epic clashes of values along with unprecedented opportunities. As the world shrinks, the moral lines that divide us become more salient and more puzzling. We fight over everything from tax codes to gay marriage to global warming, and we wonder where, if at all, we can find our common ground. A grand synthesis of neuroscience, psychology, and philosophy, Moral Tribes reveals the underlying causes of modern conflict and lights the way forward. Greene compares the human brain to a dual-mode camera, with point-and-shoot automatic settings (“portrait,” “landscape”) as well as a manual mode. Our point-and-shoot settings are our emotions—efficient, automated programs honed by evolution, culture, and personal experience. The brain’s manual mode is its capacity for deliberate reasoning, which makes our thinking flexible. Point-and-shoot emotions make us social animals, turning Me into Us. But they also make us tribal animals, turning Us against Them. Our tribal emotions make us fight—sometimes with bombs, sometimes with words—often with life-and-death stakes. An award-winning teacher and scientist, Greene directs Harvard University’s Moral Cognition Lab, which uses cutting-edge neuroscience and cognitive techniques to understand how people really make moral decisions. Combining insights from the lab with lessons from decades of social science and centuries of philosophy, the great question of Moral Tribes is this: How can we get along with Them when what they want feels so wrong to Us? Ultimately, Greene offers a set of maxims for navigating the modern moral terrain, a practical road map for solving problems and living better lives. Moral Tribes shows us when to trust our instincts, when to reason, and how the right kind of reasoning can move us forward. 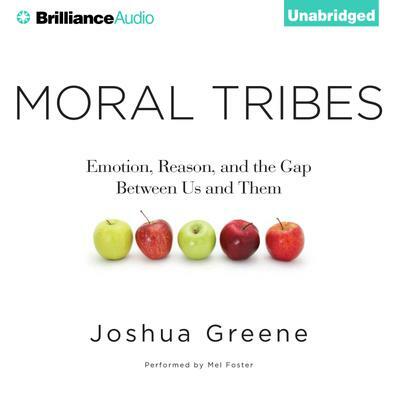 A major achievement from a rising star in a new scientific field, Moral Tribes will refashion your deepest beliefs about how moral thinking works and how it can work better.